At only two hours driving from Mexico City, the little town of Malinalco offers great deal of culture, with the second most visited archaeological zone of Mexico and one of the most important places for the Aztec culture. 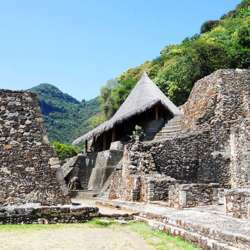 After climbing more that Protected content we will enjoy this archaeological site with pre-hispanic constructions of ceremonial and military nature erected before Protected content . This strategic location offers incredible views! After that we will continue to visit other historical sites like the Ex-Augustinian Convent and the "Parroquia del Divino Salvador", and the market of the city. The meeting point will beProtected content First we will go the archaeological zone, and then go down back to the town, to walk, and find a fine place to eat. The access to the archaeological zone is $60 pesos.